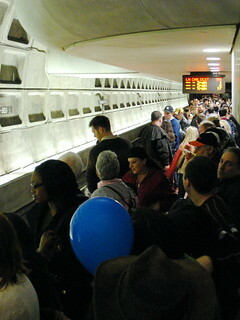 The Waterfront Metro station was packed after the National Cherry Blossom Festival Fireworks Show. There was a train on the platform when we arrived, but it was too packed to squeeze in. The sign said the next train would arrive in 12 minutes, and knowing there were thousands of people lined up behind us I thought this would be a disaster. 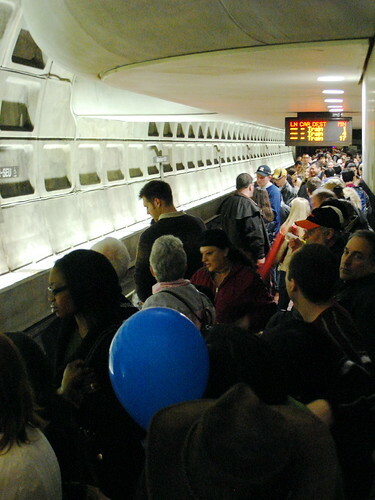 Luckily Metro ran a special train that went between Waterfront and Metro Center, helping people connect to the other lines. The sign got a bit confused when the special train turned around and prepared to enter our station. Oh well. Washington, DC.